This dossier focuses on some characteristics of the health reform processes in three southern European countries —Greece, Italy and Spain— over the second half of the twentieth century. We are interested in the proposals, projects and debates that sought to reorganise the health systems of these three countries. The paper on Italy analyses some aspects of the discussion that led to a national health service in 1978. 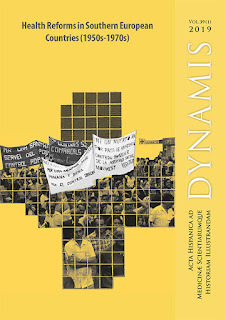 In the cases of Greece and Spain, which both underwent a period of military dictatorship in the second half of the twentieth century, we describe attempts to restructure the system prior to the health reform laws. The point of departure of the dossier is the need to define in more detail the health reform processes in the southern European countries from a historical perspective in order to contribute to the understanding of: 1) the characteristics of the health organizations that required reform; 2) the delay in the establishment of systems of universal coverage; and 3) the difficulties in the implementation of the reforms. With historical analysis it is possible to open up new paths in the study of the development of contemporary healthcare systems and to explore the similarities and differences between the three countries. Heike Karge, Friederike Kind-Kovács y Sara Bernasconi, eds. Paper proposals (200 words) and short bios should be sent by 30 April 2019 to: p.e.skinner@swansea.ac.uk with subject line ‘MEMO Symposium’. he Department of History at the University of York seeks to appoint two Research Associates to work on the project entitled ‘The Chemical Empire: A New History of Synthetic Insecticides in Britain and its Colonies c 1920 – 1970’, following the award of Wellcome Trust funding to Dr Sabine Clarke. Each post is full-time and available from 1 October 2019 for two years, until 30 September 2021. The Oral Health Humanities and Social Science Network are seeking contributors for an edited collection of essays titled 'Cultures of Oral Health, 1750-present: Discourse, Theory and Practice' (proposed publisher is Routledge, Medical Humanities Series). Edited by Dr Claire Jones (University of Kent, History) and Professor Barry Gibson (University of Sheffield, Dental Sociology), the volume seeks contributions that explore the relationships between oral health, dentistry and society drawing on a range of disciplinary perspectives including history, applied ethics, sociology, social gerontology, politics, historical epidemiology and philosophy. By producing a vibrant volume, our goal is to expand the inter-disciplinary conversation on oral health. The volume will demonstrate how a wide range of disciplines can promote a multidisciplinary understanding of oral care discourses, practices and theory. - oral health and citizenship. Abstracts of no more than 800 words should be emailed to Barry Gibson (b.j.gibson@sheffield.ac.uk) no later than May 31st 2019. Proposed publication date 2021. As of 1 September 2019, the Leiden University Institute for History will be appointing one postdoc and three PhD candidates within the project “Scholarly Vices: A Longue Durée History,” supervised by Professor Herman Paul. The aim of this five-year NWO-funded project is to write a cultural history of scholarly vices such as dogmatism, prejudice, love of fame, and love of money. The Department of History at the University of York is delighted to invite applications for a three-year PhD studentship to work on the history of Japan as a major producer of the natural insecticide, pyrethrum. This studentship forms part of the Wellcome Trust funded project “The Chemical Empire: A New History of Synthetic Insecticides in Britain and its Colonies, c 1920-1970”, led by Dr Sabine Clarke in the Department of History. Pyrethrum is a naturally occurring insecticide that can be extracted from chrysanthemum flowers. Japan established a pyrethrum industry at the end of the 19th century and Japanese scientists were responsible for innovations in insect control such as mosquito coils. By the start of the Second World War, Japan was the major supplier of pyrethrum to Britain and the US. This project will investigate aspects of the rise of the pyrethrum industry in Japan such as its international significance, and its relationship with the new synthetic insecticides that emerged after 1940. The project would suit a candidate with an interest in fields such as the history of science, technology and medicine, environmental history and/or economic and business history. Candidates will need a good reading knowledge of Japanese. The deadline for applications is midnight (BST) on Friday 17 May 2019. A stream on the historiography of tropical and subtropical architecture to be presented at Urban Tropicality: the 7th International Network of Tropical Architecture Conference, December 5-8 2019, Brisbane Australia. The Department of Philosophy, University of Geneva, is inviting applications for a fully funded Ph.D. position with some teaching duties (teaching will be in French). Candidates must be fluent in French as well as English and are expected to hold a Master’s degree in philosophy or in a scientific discipline with additional training in philosophy. The position will be for a maximum duration of five years. The remuneration will start at 46,247 CHF in the first year and will reach 78,528 CHF in the final year. The Department has a vibrant and international philosophical community and offers career support to Ph.D. students. Applications should include a CV, grade transcripts, a writing sample (e.g., the Master’s thesis), a short description of a Ph.D. thesis project in the area of philosophy of science and two academic references (addresses only). Please send dossiers as a single PDF file to marcel.weber@unige.ch. To ensure full consideration, applications should be sent by 30 April 2019. Persons belonging to groups disadvantaged by the present distribution of privilege are encouraged to apply.